With so much need in the world, how does the church even begin to reflect the inclusive and generous nature of God? The women of Auburn Grace in northern California would say that it starts by meeting a need in the local community. My Best Friend’s Closet is an annual event that brings women in the Auburn, Calif., community together through the joy of a commonly loved activity – shopping! 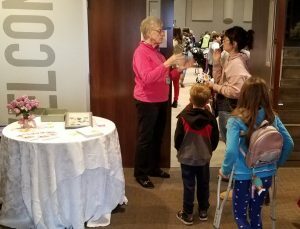 This year, on February 1 and 2, nearly 40 volunteers, and members of Auburn Grace Community Church (Phil Sparling, senior pastor) set up a boutique-style shopping experience with hundreds of donations. The experience began four years ago as the brainchild of Ruth Sparling, the pastor’s wife. Since then, women of the church have taken the reins. This year, Leah Capuchino, a member of Auburn Grace, continued the tradition. With the event taking place on a Friday and Saturday, Capuchino and the volunteers began their work on Thursday by converting the church’s sanctuary into a boutique. The items are organized to make the experience relaxing and enjoyable for the women who attend. “It is important to us to create an environment that gives our guests dignity and a little pampering in their shopping experience!” she added. By providing a stress-free experience, women are more likely to return the next year, allowing space for volunteers to build relationships and show them the love of Christ. Each attendee’s shopping experience begins with volunteers giving her $100 of “funny money,” which is simply currency printed with the Auburn Grace logo. Prices on items ranged from $1 to $10. However, attendees are not always limited to $100 of funny money. “When we encounter someone who has selected more than the $100 worth of items, we speak with them about their need,” Capuchino says. Often, volunteers discover that these women are shopping to meet the needs of many others. Capuchino says that there were a few Spanish-speaking women who came to the event this year because they were not only shopping for their families here, but for family members in their home countries, including El Salvador, Honduras, and Mexico. One woman, who helps run a boarding house for recovering drug addicts, came seeking items for the women she houses. After the event concluded, remaining items were given to local Christian charities. Not only is My Best Friend’s Closet an effective means of drawing women together in fellowship, but it also serves as an opportunity for the volunteers to share the gospel with the women who came to shop. “We offer spiritual counseling and prayer in a confidential environment to any who come seeking,” Capuchino noted. This year’s event brought in 322 women. Among these were two who would forever have their lives transformed by coming to a saving knowledge of Christ. One of these women was pregnant and expecting her baby on that very day. “The amount of families that came through our doors has inspired me to consider children and men’s clothing for next year’s event,” said Capuchino. She admits that she is pleased with the way this year’s event turned out. Lindsay Schuster is a senior at Grace College from Brownsville, Tex., and is majoring in English, with minors in marketing and creative writing. This article appeared in the Winter-Spring 2019 issue of GraceConnect magazine. Click here to read the complete issue. If you’d like it mailed to your home at no charge, click here to subscribe.